Jose de Azpiazu, a Spanish (Basque) composer, arranger and guitarist, Azpiazu started to play the guitar under ther guidance of his uncle at the age of 13. Azpiazu career began at the age of 24, after a debute in Radio Bilbio. 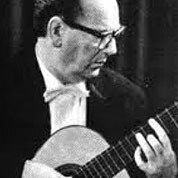 In addition to his pedadgogic work Azpiazu is known as an arranger and composer of guitar music.